Marvelous Sicily is the paradise island on the tiptoe of the Italian "boot" and one of the most unique European destinations, ready to embrace you with its shining sun and legendary Italian passion. Shrouded in glorious history and romance, the island of Sicily is a spicy merge of Greek, Arabic, and Italian cultures in one bottle (which will definitely be to your taste). We bet even the mention of such a delicacy as Sicily has already made your mouth water, huh? In continuation, we'd like to introduce you to the unique things you can do on the biggest isle of the Mediterranean during your Sicily getaway. Speaking about appetizing holiday destinations in Europe, Sicily, for sure, holds the leading positions in this nomination as the Sicilian shores are literally studded with excellent resorts you'd like to stay at. To enjoy the emerald water and outstanding beaches to the fullest, you are free to choose among the best resorts in Sicily, including the main ones in Taormina, Palermo, Agrigento, and Catania, each providing its own unique flavor and plenty of activities. Love to be in the thick of things? Head to the fabulous resorts on the northern part of the island like San Vito Lo Copo near Trapani and Mondello, located close to the Sicilian capital, Palermo. This area is famous for its colorful celebrations and events, great infrastructure, and nice opportunities for water sports. In case you prefer a more intimate and relaxing atmosphere, you'll be pleased with spending time on the "bounty-like" beaches and thermal waters of the isles of Linosa and Lampedusa set in the Mediterranean Sea and boasting mind-blowing views of the untouched nature. Craving to find some extraordinary things to see in Sicily? Then you should know that Catania surroundings are famous for their beaches with black volcanic sand. Probably the most popular one is Aci Trezza, the beach of rare beauty, nestled among picturesque rocks and providing great diving opportunities. Moreover, traveling around Sicily's shore, you have a chance to become the navigator of three seas. How? The island of Sicily is washed by three different seas, Mediterranean, Tyrrhenian, and Ionian, so why not to travel around the whole island and swim in all three? In fact, Sicily is not only the paradise corner, suitable for lazy basking under the sun. The legendary island has preserved its centuries-old history and traditions which deserve to be discovered. In all times Sicily was an attractive tidbit for foreign raiders who, apart from conquests, left their traces in the island's culture. If you have a particular interest in Greek legacy, make your way to Agrigento to see the UNESCO listed Valley of Temples. The territory of this renowned Valley covers 1,300 hectares, making it one of the largest archeological sites in the world. We advise exploring the place in the second half of the day in order to catch the striking view of the ancient ruins in the last golden rays of the sunset. 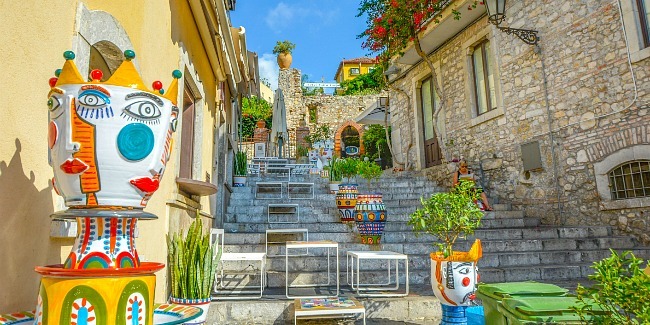 The Sicilian capital, Palermo is a city of contrasts which also meets the high traveler's demand. From the very first minutes in the city, you dive into the harmonious mix of Arabic mosques and Catholic churches, Istanbul-like streets, and typical Norman palaces. Walk along the fancy quarters, drop in one of the local markets, take a couple of pictures by the gorgeous Palatine Chapel, and fall in love with lovely Palermo forever! Choosing among other cities in Sicily, we definitely recommend to set foot on the motherland of Archimedes, Syracuse, see the medieval cathedral of historic Cefalu, get inspired by the fantastic architecture of Catania, topped by the fairytale castles of Erice. Still need more reasons to pack your bags and just set off on a Sicily trip? Then you should know that this hilly island is home to simply mesmerizing landscapes! Even if you are not an avid photographer, be ready for an overwhelming wave of inspiration and inability to stop your camera shooting. Bizarre rocks and caves, green hills and endless vineyards, the crystal blue waters crashing on the shores…isn't it what paradise looks like? However, it goes without saying that the most remarkable of all natural Sicily attractions is Etna, the largest active volcano in Europe which dominates the eastern part of the island. Those craving for some action may challenge themselves by climbing this famous giant! What is more, you can celebrate your victory with a glass of fine wine right after as the region around the volcano stands among the best wine-making areas on the whole island. What a lucky strike, isn't it? No other thing can manifest the true Sicilian character better than its outstanding cuisine as it perfectly uncovers traces of all cultures and nationalities that ever set foot on the island. Sicilian gastronomy is, indeed, the triumph of tastes, primarily revolving around local seafood, meat delicacies, pasta, and amazing desserts. Thus, an extensive degustation can enhance your list "Sicily: things to do" for sure. So, sweet teeth from around the world, are you ready for the moment of pure joy? While traveling along the Sicilian cities, you just have to try Sicilian cakes like "Cassata Siciliana" and "Trionfo di Gola". Also, make sure to taste the famous "Cannoli", a tube-shaped pastry filled with sweet cream. And as a final chord of your sweet symphony, make sure to have some local Sicilian "Brioche con gelato", this so-called ice cream "sandwich" is a heart stealer that's simply a perfect way to reward yourself for all the walking and sightseeing. Sicilian wines also deserve special attention as they are one more way to treat yourself to an exceptional gastronomic experience. Local wines are characterized by rich flavor and saturated taste. The most popular red wines produced in the region are Cerasuolo di Vittoria and Nero d'Avola. So don't spare yourself the pleasure to spend an evening or two relaxing in a cozy local restaurant, otherwise, it will definitely be a miss! To sum up, opting for Sicily travel is a great choice for those dreaming about a perfect European getaway which can combine exciting historic sightseeing, excellent resort leisure, and breathtaking natural scenery, all spiced up with a yummy gastronomic experience. If Sicily is not on your bucket list yet, browse our collection of tailor-made Sicily tours and set off on a vacation of a lifetime.